Cornell's "Celebrate Urban Birds" is having a fun contest -- Funky Nests in Funky Places. Get out your pictures of nests in strange places or try your hand at some art project - making a nest and enter to win from a neat variety of things from bug repellent wrist bands to several books - even a NEW Leica Camera!! "The dove thought it was an ideal location, apparently (right next to a lantern, you'll notice)! In my opinion, this bird's feathers are so smooth and perfect you almost can't tell the bird is "real" (not stuffed, or fake...)....but she is! She was also indifferent to my presence....caring less that I was inches away from her, taking pictures. If only all my avian subjects were so helpful! (Barn swallow mothers dive bomb me, when I even approach their nests of babies...!) I think the location of the Baker's Rack nest is especially funny, since Baker's racks are often found in kitchens, with cookbooks on them (for instance). 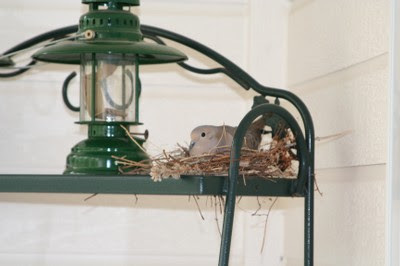 Ms. Mourning Dove decided to cook up a little recipe of her own (for babies)!"